Tea Party Brings Big Demands, Small Crowd To Hill In Bid To Keep Up Pressure : It's All Politics The outcome of the debt-ceiling fight might still be uncertain inside the Capitol, but many of the Republican speakers who spoke at a Wednesday noon-hour Tea Party rally outside, including U.S. Senators Jim DeMint (SC), Mike Lee (UT) and Rand Paul (KY), were already claiming a measure of victory. Tea Party rally near the U.S. Capitol, July 27, 2011. 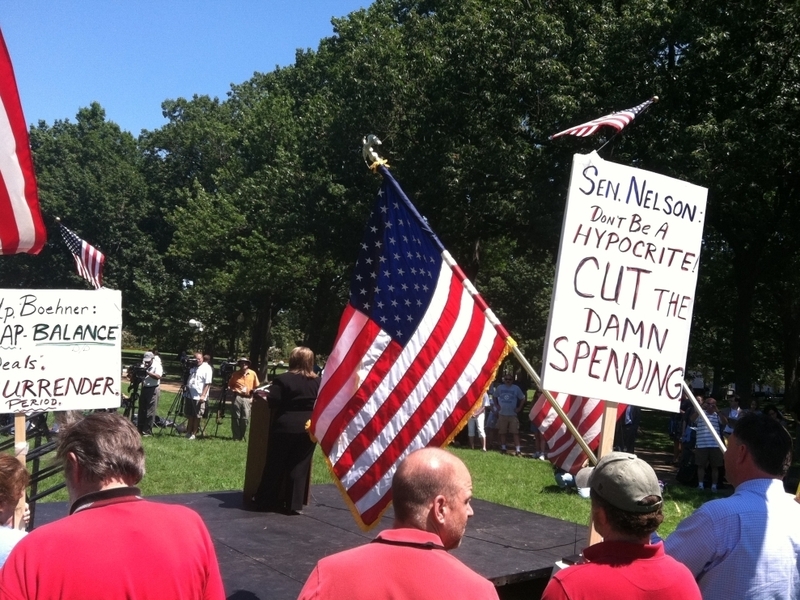 The outcome of the debt-ceiling fight might still be uncertain inside the Capitol, but many of the Republican speakers who spoke at a Wednesday noon-hour Tea Party rally outside, including U.S. Senators Jim DeMint (SC), Mike Lee (UT) and Rand Paul (KY), were already claiming a measure of victory. But if the Tea Party was hoping to put on a big show to keep up the pressure, the images from the rally will fall far short. The crowd numbered less than a hundred by the time you subtracted Hill staffers, journalists and camera crews. The huge grassy space in front of the stage was empty, except for a row of TV cameras. The rest of the attendees sought shelter from the sun along a shaded sidewalk well to the right of the stage. It made for remote viewing of the event, and made efforts at call-and-response chanting initiated by several speakers problematic. Organizer Amy Kremer, the founder of Tea Party Express which sponsored the event, claimed: "If it weren't for us, then the debt ceiling already would have been raised." She, and others, urged those in attendance to keep up the pressure on the Republican leadership, especially Speaker of the House John Boehner, to "Hold the line" in ongoing talks with the White House and with Senate Majority Leader Harry Reid. She downplayed the predicted negative impact of failing to raise the debt ceiling, saying the debt ceiling isn't the problem, it's excessive government spending. Each speaker promoted the Cut, Cap and Balance plan that passed the US House, but goes nowhere in the Democratic-controlled Senate. Senator Paul, a Tea Party favorite and one of it's biggest success stories of the 2010 elections, was cheered as he criticized the Boehner plan in the House as not going nearly far enough in terms of cuts. But Rep. Joe Walsh of Illinois actually defended Boehner. He said he's proud of the GOP leadership, and answered frustration over the lack of a Tea Party acceptable deal by asking the audience to "imagine having to negotiate with Harry Reid and Barack Obama." In the small crowd watching the speeches, there was some understanding, but not much praise for Boehner. Steven Latchford of Apollo Beach, Florida said the speaker's got a tough job, but he's not satisfied with where things are going. On the Tea Party's all or nothing stance, Latchford said: "The compromise needs to be on the part on the spenders because time and time and time again we've got these promises that we're going to raise taxes and that we're going to cut spending on the backside and the spending cuts never come. "The time for compromise is now and it's the Democrats in the Senate that need to come around."